So I was working on planning my next 5th grade lesson a few weeks back when I was told that I needed to have a student display of artwork recognizing 'Hispanic Heritage Month' for a school event coming up. 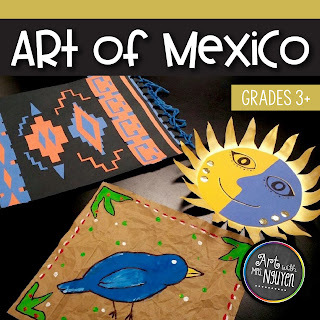 So I decided to do a week long 'Art of Mexico' lesson with my 5th graders. Personally I've found 5th grade to be the hardest group management-wise to work with (because of their class sizes, noise-levels, and physical presence in the room)... but found during an earlier project, that if I separated them into different groups working on different things, I could keep them more focused on their projects. 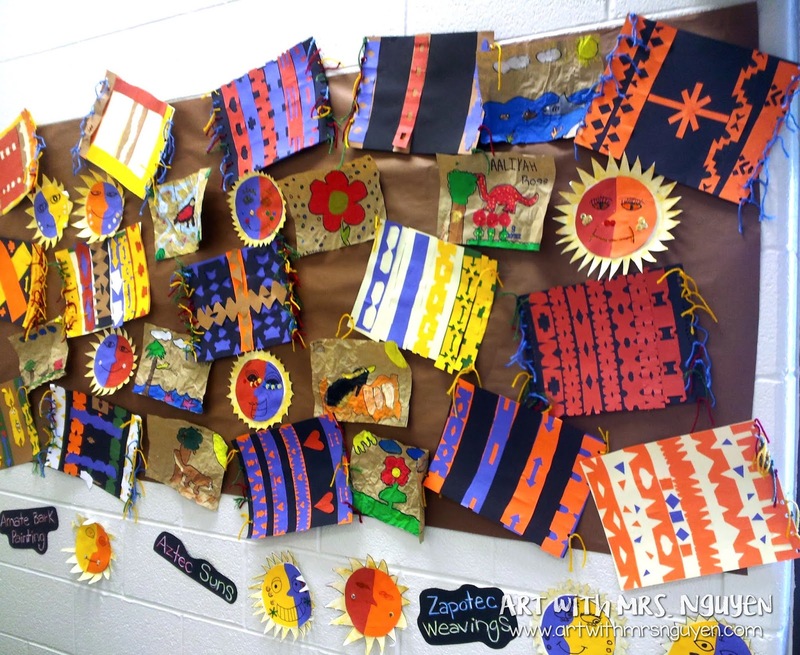 So I decided to go crazy and try doing a week project in which students freely moved amongst 3 centers: Zapotec Weaving, Aztec Suns, and Amate Bark Paintings. On Monday we all looked at a PowerPoint reviewing the historical background of each center and I had students fill out the information they learned in a brochure we made (we even filled in a map to see where the indigenous groups lived!). Students also used this brochure to create sketches of their project ideas. Students will begin with a piece of black or tan 9"x12" paper as their base paper. Students will select 2-3 additional pieces of colored construction paper to make geometric patterns/shapes with to add to their "weavings". The teacher will demonstrate how to cut the paper into strips, fold it, and then cut it to create symmetrical shapes/pattern strips. These pieces will be carefully glued down. When the patterns are completed, students will use a hole puncher and punch holes along the left and right hand sides of the paper. Using bits of scrap yarn, students will tie their yarn into the holes to create a fringe. 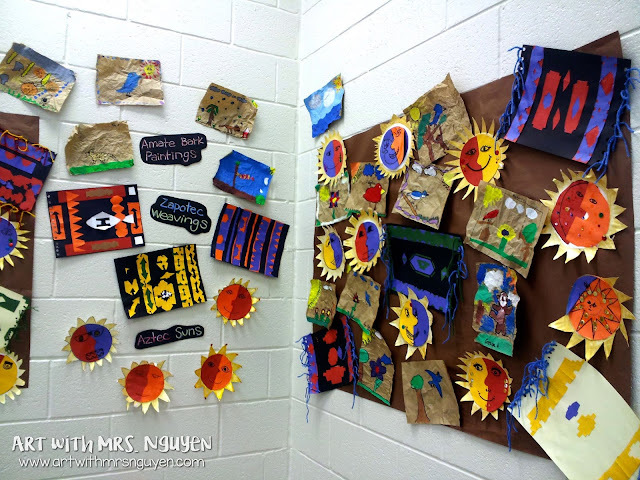 Students will create their own aztec sun replicas. They will begin with a paper plate whose outside rim may be cut down to create wavy points (sun rays). These will then be painted gold using gold tempera paint. 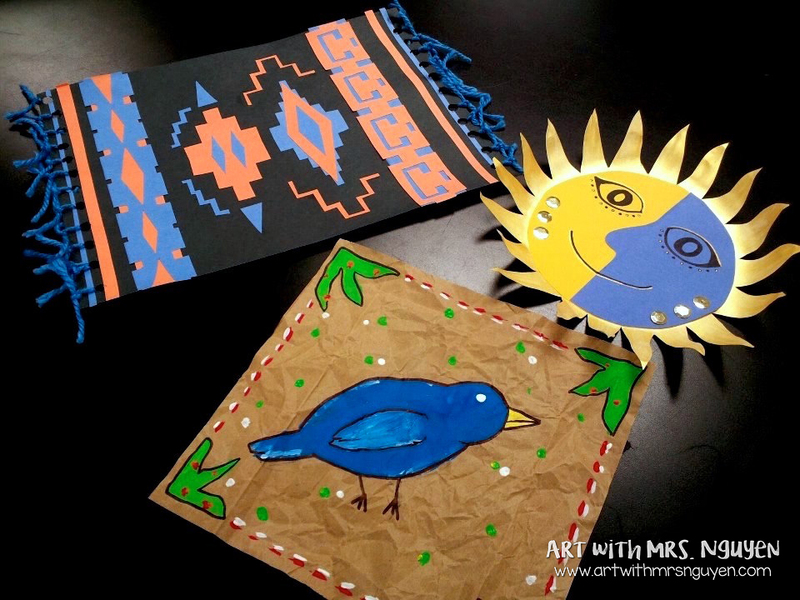 Using a circle stencil, students will cut out a face for their sun using construction paper. This circle will eventually be glued down onto the center of their cut paper plate. Additional detail such as facial features and additional lines/shapes/pattern will be added using an assortment of materials (including sharpie, construction paper crayon, paint, sequins, etc.). Students will create their own amate bark paintings by drawing their designs (in pencil) onto a piece of brown paper (cut down from a brown paper bag). 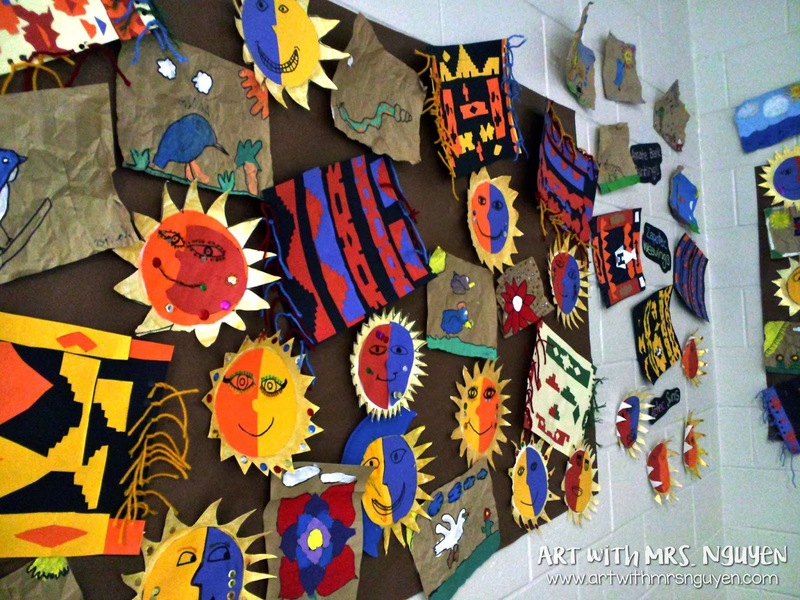 Using an assortment of pre-mixed tempera paints (from an earlier 3rd grade project), students will paint their images onto their "bark paper". Once dried, students will use sharpie markers to create black outlines around their images to really make them pop. Then they will crumple it (to create the illusion of bark texture) and then lay it flat. If you are interested in a more thoroughly explained lesson plan with visuals, teacher and student directions, and all the other resources I used, check out my store! This looks amazing! I have always been fascinated by centers based art classrooms but apprehensive about implementing that type of system due to classroom and behavior management. I never thought it could be a >ii< to management. How did you set up the procedures? Did all students complete all three of the projects? How were you able to help all of them? (I have some classes that are extremely dependent) The artwork looks great! Students began at their regular tables.. so at the end of class on Monday (the day we talked about the history and such) I went to each table and gave them a brief rundown of what they were going to do starting the next day. I also hung up signs at the ends of each table that had brief step-by-step directions with illustrative doodles. I told students to start by looking at the poster, asking people at their center, then if they still had a question or needed help, to raise their hand and I would come over. Was I running all over the room on Tuesday? YESSSSS. But Wednesday-Friday it became a lot more peer-teaching (which was really great to see)! The students were also held responsible for completely cleaning their centers and putting everything away (cleanup time took 7-10 minutes each time - longer than usual.. but we had A LOT of stuff going on and stuff on the tables). And no not all students completed all three centers.. but I didn't require them to. I told them if they wanted to spend all 4 days at the same center.. they could.. as long as they were working well and making progress. It was a really student-directed project. As students finished though, I did have them check off their name on a class list I printed out with each of the three centers on it (to help me keep up with who did what). I'm happy I did this with them these past few weeks though.. my next 5th grade project is a sewing project which is going to be much more teacher-directed and a little more stressful I'm sure. Hello! Thanks for another excellent post. I can add to this you list of ideas that I've pinched in the past!